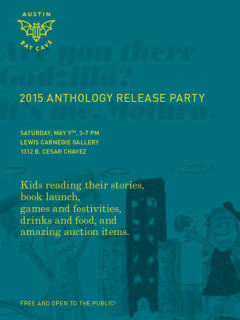 Join Austin Bat Cave to celebrate the annual publication of its kid-written anthology, Are You There Godzilla? It's me, Mothra, which celebrates the art of notes and correspondence. Students will read their work, bands will play and piñatas will be violently beaten. Enjoy treats from an ice cream truck, tamales, typewriter poems and a stuffed animal petting zoo. An auction will feature opportunities for unique correspondence with the likes of Lena & Grace Dunham, George Saunders, Karen Russell, Rick Moody and others. All donations and auction proceeds will go to support Austin Bat Cave's free writing programs for kids.